Sometimes what you need is as easy as one word; DIRT. Dirt is an aggregate of many different materials; sand, minerals, organic materials, etc. Fill dirt is usually an aggregate heavy with sand and waste materials (like crushed cement, bricks, tiles etc.) On the other end of the spectrum, top soil, is heavy with organic materials and is free of waste materials. Fill is a great product for raising elevations, filling voids, reclaiming land lost to erosion, and more. It is not for growing plants, yards, play areas, etc. In general, the less a fill dirt costs, the more trash and large particles it will contain. This products is generally know as fill. This is fine, as long as the waste is mineral or organic. Inorganic materials, like tires, plastics, etc. tend to float overtime. No one wants to find a tire or plastic bottles popping up in their yard a few years after their project is finished! Clean fill is free of garbage. It may contain waste aggregate, but generally in small(ish) chunks. Top soil is excellent for yards, plant growth, play areas and more. 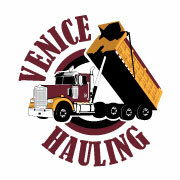 Venice Hauling delivers a beautiful product that is somewhere in between fill and top soil. It is clean of most construction debris and large aggregates, it has excellent compaction, very good drainage, and a medium organic material content. It can support plant life with minor amendment and additives or it can server (excellently) as a building material.